The 1901 Gatchina Palace Egg is made of "quatre-couleur" gold, opalescent white enamel, opaque red, yellow and green enamel, diamonds, seed pearls and velvet lining. The miniature palace is made of quatre-couleur gold. The Egg is divided into twelve panels by lines of pearls. Portrait diamonds are set at either end, but the monogram and the year of presentation, which were probably set beneath them, have been removed. The gold Egg is enameled opalescent white over a guilloche ground, under painted in a delicate design of green and gold leaves, pink roses and red ribbons tied into a variety of bows. Continuing a practice initiated by his father, Alexander III, Tsar Nicholas II presented this Egg to his mother, Maria Feodorovna, on Easter Day in 1901. Faberge's revival of 18th-century techniques, including the application of multiple layers of translucent enamel over guilloche or mechanically engraved gold, is demonstrated in the shell of this Egg. When opened, the Egg reveals a miniature replica of the Gatchina Palace, the Dowager Empress's principle residence outside St. Petersburg. So meticulously did Faberge's workmaster, Mikhail Perkhin, execute the palace that one can discern such details as cannons, a flag, a statue of Paul I (1754-1801), and elements of the landscape, including parterres and trees. 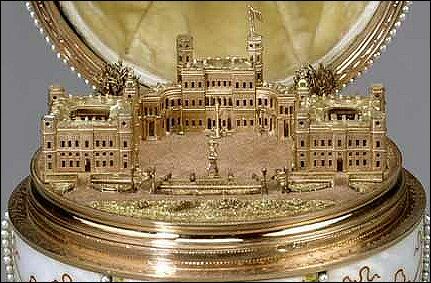 The miniature palace is NOT fixed inside the Egg and can be removed from it, like the 1908 Alexander Palace Egg, which Fabergé would create seven years later for Alexandra Feodorovna. * Correction July 2016. The Gatchina Palace was Alexander III's favorite palace and after his death in November 1894, the Dowager Empress retained Gatchina as her winter home, even though he did not share her husband's enthusiasm for the Palace. Obviously, Maria Feodorovna's distaste for Gatchina either faded or remained a well-kept secret. Fabergé would certainty not have created this Egg otherwise. The village Gatchina was a small sleeping village when Catherine II (Catherine the Great) decided to build a palace there for her lover, Grigori Orlov, who helped her to the throne after a coup in which Catherine's husband (Peter III) was killed. Work started in 1766 and Catherine was constantly overseeing the works. After Orlov died, Catherine bought the palace from his heirs and gave it to her son Paul Petrovich. Paul hated the idea that Gatchina was build for the murderer of his father, but nevertheless he become fond of the Palace. 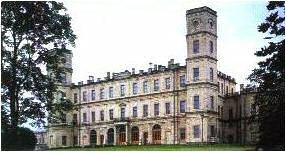 The Gatchina Palace was abandoned by Paul's son, Alexander I but was used again by Nicholas I, who build two new quarters. The Tsars Alexander II, Alexander III and Nicholas II used the palace from time to time but did not change much on the exterior. The Gatchina Palace Egg was bought in 1920 by Alexander Polovtsov, a former employee at the Gatchina Palace, later a Russian émigré in Paris, probably from officials of the Antikvariat. In 1930 sold by Polovtsov, together with the 1907 Rose Trellis Egg, to agents of Henry Walters from Baltimore, Maryland. In 1936 displayed in the Walters Art Gallery and from 1952 on permanent exhibition in the Walters Art Gallery, Baltimore, Maryland, USA. * Correction July 2016. The little palace is NOT fixed to the Egg. 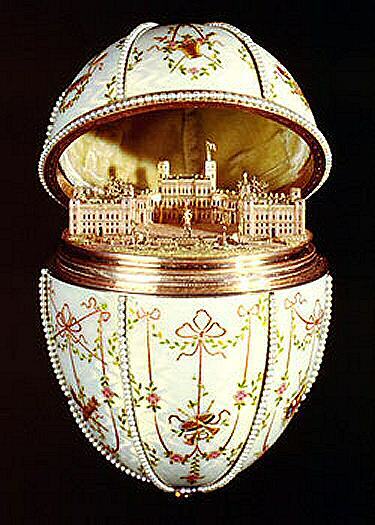 Fabergé made the Egg with the palace removable. Underneath the palace is a small space probably for a jewel, that sadly is long lost.